Shopping for a new phone this season? You just might have found what you are looking for – The Infix Hot X507! Remembering a statement from one of Google Android’s officials a while ago that ‘Android 4.4 (KitKat) will not require much hardware requirements’ so it can run flawlessly on low end devices; today, we’re seeing the prophecy in all shades of fulfillment! Yes, the Infinix Hot X507 is another budget device running Android 4.4 (KitKat) and has come to stay! Infinix Hot X507 is a 5-inch DUAL SIM Android smartphone that spots a smooth looking face along with an anti-scratch-like plastic cover around it. Want to confirm the screen size? Simply get a ruler and measure (in inches) across the screen (diagonally) from one end to the other. Similar to Microsoft Lumias, the smartphone makes its way with 5 colour variants including White, Black, Red, Yellow and Green. Your choice? Decide! Aside wide screen and well-designed textures, the Infinix X507 comes packed with 1GB of RAM that promises to deliver smooth sailing just fine and 16GB of ROM to satisfy an average Android user’s storage needs. Technically, we can say this device will operate quite at a fast speed with its 1.3GHz Quad Core processors. While this is considered a budget device, the basic 5MP camera is sure something nice to take good pictures of 2592×1944 pixels. Plus, with its LED flash, taking room pictures shouldn’t be a problem. Also, if you are someone like me who can’t go a day without screaming ‘selfie’, the 2MP front-facing camera on the Infinix Hot can make your day. So that’s the Infinix Hot in all its bells and whistles! Trust me, it’s a device you’ll love when you consider the price. Speaking of price & availability…. 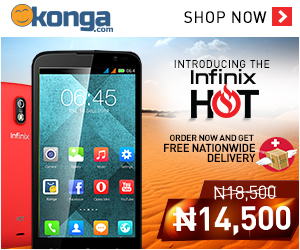 The Infinix Hot X507 is available via Konga.com and is pegged at N13,400. A few days before this post, the price tag was N12,900. You’d want to make haste to get your very own KitKat smartphone right?